To me, freedom is access to water – clean rainwater, harvested from my roof, and recycled water generated by my sewage system which I use to grow organic food. After reading ‘Freedom 2014’ (BBC News on line’s article, 31.3.14) I thought about what actually makes me feel and live in freedom. Free speech, freedom to vote in a democracy, things like that immediately sprang to mind. But then I thought about how easy access to water makes me feel and live in freedom. I learned to value water on wheat and sheep farms in Western Australia in 1982. On one farm near Winchester, we showered using solar heated water. First, you soaped yourself clean using non-potable bore water. It had so many salts in it it was unsuitable for irrigation, and as it dried, your skin felt sticky. So after soaping down, you rinsed it off using rainwater. The practice cut rainwater use by two thirds. I learned to appreciate clean drinking water after visiting places where tap water is unfit to drink. In Indonesia, brushing your teeth or opening your mouth in the shower, risks infection. Here in Brisbane, I’m doubly blessed. Having my own sewage system allows me to reduce my use of town water, leaving a little more in a dams for others to use during drought. I use my recycled water for flushing the toilet and the surplus for growing food, another economy that leaves more water in a dam for others. 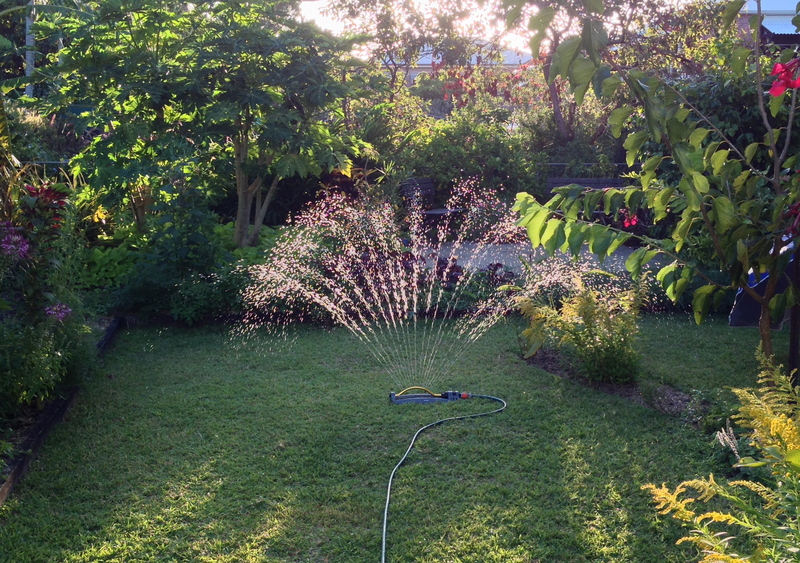 During five years of drought (2005 – 2010), I learned that watering with recycled water by hose was in itself, freedom. It allowed me to grow food during a hosepipe ban, and it also gave me the economic freedom to eat organic food at low cost. Following satisfying rain, you’ll still find me watering the garden. It looks nutty, especially if it’s still raining, but my sewage system works every day of the year. If I don’t use the recycled water, it empties the surplus into the sewer and the nutrient rich water ends up polluting Moreton Bay. So I use it up. Every day, without fail. Even if that means just giving my bamboo or my cocoyams a deep, deep soaking. After the second dry ‘wet’ season in a row, and with an El Nino forecast to develop this spring, I’m dusting off my water saving strategies and reviewing how, where, and how often I use water at Bellis. At Bellis, every drop of rain that falls on my roof is used at least twice, and that’s been the case for the past decade. In 2009, the household won a National Save Water Award for its efforts. In a warming world, where weather patterns have changed and will continue to alter for the foreseeable future, and where there are more mouths to feed every day, having reliable access to water is, to me, the very essence of freedom. It is a waste water system, not just grey water. I made a development application to council in 2003 and that’s why this website started – to answers questions like yours, just read through it.